Lovely colours & atmosphere in your piece. Okay, here me when I say, ” God lives in your hands!!!!!! And this is truth. You are amazing!!! Love your colours and yes theme. Beautifully done. wow that is really lovely! what a lovely montage of beautiful illustrations. The colors are so fun and fresh. Beautiful work. LOVE your watercolors!! I love this. You are so very talented. The colors, shapes, and composition are amazing. 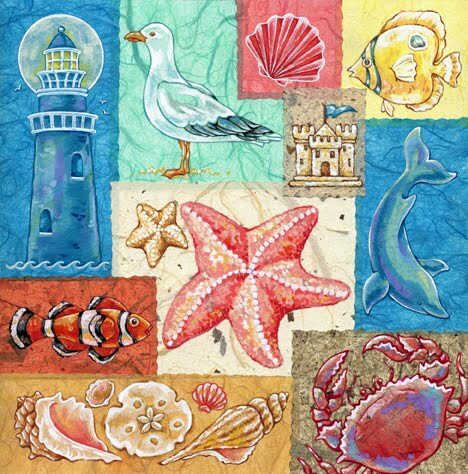 Lovely painting representing the ocean and beach! Hard to believe that summer is just around the corner. Great use of color as well as lights and darks. I agree! Spring is ALWAYS a welcome sight for many of us New Englanders… but once it starts to warm up I automatically fast forward to the balmy days of summer. Gorgeous art work with lovely colors and form. Oh I had something in mind like springy colors and then I read Bella’s comment and all I want now is to see her in a bathing suit at the Cape! That’s called eternal optimism. 🙂 Oh, this is sun-shiny and happy! I can hear the lapping of the waves. I want to throw on a bathing suit and romp on the sand. I want to go to the Cape! Beautiful! I like the different type of framing, it gives a open feeling and it’s fits the theme of the ocean perfectly! Luv those shells! Can you teach me how to paint those? A lovely illustration Krista. You are so right, it’s so easy to keep looking forward, ahead to the next thing. Really nice! Love all the images and what they represent! lovely, I love the beach, seashells, the ocean, yum, crab! HA, good one! I love the shore (especially the Cape) and miss it a lot. Such a beautiful color palette, love those shells! Was this ever made into a tapestry or throw? I love all your themes and alphabet creations! Wonderful colours in this; our weather is still more like January than Spring. Great interpretation and beautiful painting!